No one in the long history of the “The Phil Donahue Show” appeared more often than Ralph Nader. Today, these two old friends have a wide-ranging and intimate conversation about media, politics, the Catholic Church, Donald Trump, and more. 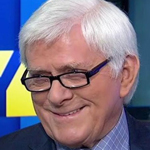 Phil Donahue, host of the “The Phil Donahue Show” later known as “Donahue” had a nearly thirty year run on American television that along the way garnered him twenty Emmy Awards. The show touched on the serious social and political issues of the day and was the first to include audience participation. Regarding the talk of cruise missiles and drones, while those are bad enough those don’t concern me nowhere near as much as the MOAB bomb. At the risk of oversimplifying it, this is a non-nuclear WMD and one that Trump dropped during the Nangarhar airstrike of last year that killed 94 people. I’d call that a WMD because if I recall right it had a blast radius of 1.5 miles. Reason I fear this most is it is a WMD but without any nuclear fallout or drift that wipes out even more people for a given time after the blast. It’s a safer version of the WMD, I’m sure military brass figures it’s environmentally friendly. Considering that the US is losing its grip internationally, the US dollar will likely cease being the world’s reserve currency in relatively short time, and that America won’t go quietly, I can see this bomb being dropped everywhere once the Great American Collapse enters its final stage. Which may trigger NK et al to launch actual nuclear missiles. IOWA’ s BAR Associates Attack whistle-Blowers , People Of conscience, political dissenters, Patriots, and the families by unconscionable Prosecutors, Judges, And State Public Defenders. The level of psychopathy is seen in the Mike Wise Show episode: Cancer Patient On Trial for Cannabis. You Tube: Iowa Corrupt Judges Courts Police http://www.youtube.com/user/KornKobIowa And read more details posted in comments below videos. This is surreal. The families this government is destroying and their crimes against humanity is outrageous and egregious. Trump and Iowa want a legitimate AG. Ralph – you need to find local leaders who can speak like you do… but then you’re brilliant and articulate and informed and have done so much.. it’s hard to find those kinds of charismatic leaders out here where slick ruthless propaganda that Chomsky describes in detail dominates – and Phil tried to point out the obvious flaws thatblock any of this happening… I knowRalph you have faith that the people can rise up – but I’m not sure that is possible anymore with the dumbing down of education, with the massive corporate propaganda on tv, with the billions from oligarchs/billionaires/corporations on tv touting their corporate lackeys in Congress… we need revolution sadly.. probably a violent revolution adn I don’t think americans are capable of that. Chris Hedges is so right. You need to go head to head with Chris Hedges. Americans seem to wallow unselfconsciously in the toxic luxury of disagreement and quibbling. Is it that the American people are dumbed down or that they look at things – as always – with unrealistic expectations, or that we do not know how to form community or even political consensus despite, as was covered in Michael Moore’s latest movie Fahrenheit 11-9 – the majority of American hold very similar and LIBERAL values. Since humans are sort of behavioral replication units, when we see this modeled in the media, and no counter model or nothing that focuses it as a thing in our attention, we naturally assume that is what is normal and valuable behavior. I had a crush on Ralph Nader as a kid. I used to love his show bc of his point of view, and I still do Today! I graduated in ’65. I started school at 5yrs old and I think it was the Worst part of my childhood. BUT …. The Best part is: It gave Me my Roots in Jesus Christ & from that I’ve realized Nothing is ALL Bad. We, as a Nation We WILL Recover from this Chaos, Self Indulgent Insanity of ONE man whose Insecurities should be medicated Not enabled. Nice comment Stephania. I was raised southern baptist, which I noticed back then was grounded in hatred. This is the religion that was perfectly ok with hanging blacks from trees and bridges way back when and to this day refuses to confront its past. I’ve come to the conclusion that any organized religion is the bane of the true Faith it claims authority over. MLK’s declaration that the ‘arc of history bends toward justice’ was a fine idea and hope is necessary in dark times, but its sounding like false optimism today. The truth today is glaring: America is not bending toward justice. America has been bending away from Justice. The majority of Americans are not supporting Justice. Rather, the majority support American Empire Exceptionalism, heavily promoted by neocons backing both Trump and Hilary in 2016. Together these two Exceptionalist candidates received about 50% of the vote. Another 47% or so didn’t vote, leaving the field clear for Exceptionalist Trump or Hilary. Only 1% of voters went for Jill Stein, the only 2016 candidate that clearly rejected Exceptionalism. The majority of American voters directly and indirectly support Exceptionalism —-with all its baggage—human rights abuses: abuses of women, gays, immigrants, refugees, blacks, the poor, indians, old people, working class through low minimum wages, other nations laws and rights. I don’t think the American voters for Trump and Hilary give a hoot. about these abuses. Americans are not ‘bending toward Justice’. i’m not about to complain, really it’s the opposite in that i’d like to hear more. The question about the 2nd revision of the book “good pills, bad pills” & how come that other couldn’t get on these days with a 2nd edition despite the ratings, viewership, profits, etc.. The question was from Ralph to Phil. The same question rearranged under an alternate guise later on but i feel like i wish just that 1 avenue of inquiry deserves its own show with more longer time answer from both Phil & Ralph, please? I always loved Phil and the way he told the truth with his kind interviews. Of course, the love story with Marlo Thomas was so fun! Hope you are still both happy and healthy! Thanks! The”News” channels failed to be honest or caring are worse, now. I hope our young people and , now especially women are waking up and fighting back! I wish you could interview Trump! Thanks again. © 2015 Ralph Nader Radio Hour. All Rights Reserved.